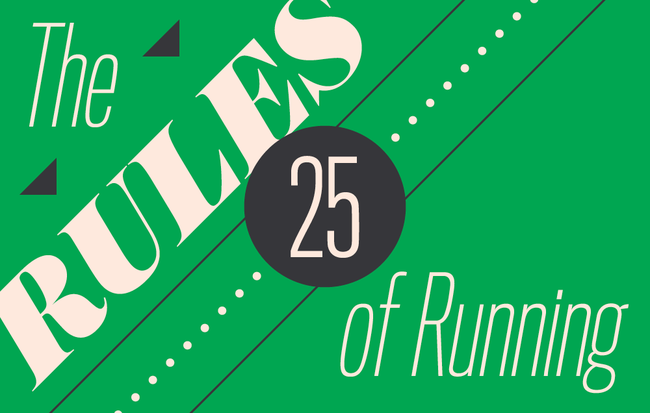 In most cases, these rules started out as a lightbulb over one runner’s head. After a while, that runner told a few running buddies (probably during a long run), word spread, and before you know it, coaches were testing it, sports scientists were studying it, and it evolved from idea to theory to accepted wisdom. 1. The Specificity Rule: The most effective training mimics the event for which you’re training. This is the cardinal rule of training for any activity. If you want to run a 10K at seven-minute-per-mile pace, you need to do some running at that pace. “Runners are best served by running at goal pace and in the expected environment of that race,” says Ann Snyder, Ph.D., director of the human performance lab at the University of Wisconsin-Milwaukee. The Exception: It’s impractical to wholly mimic a race—particularly longer distances—in training because it would require extended recovery. So, when doing race-specific training, keep the total distance covered shorter than the goal race, or run at your race pace in shorter segments with rest breaks (interval training). 2. The 10-Percent Rule: Increase weekly training mileage by no more than 10 percent per week. 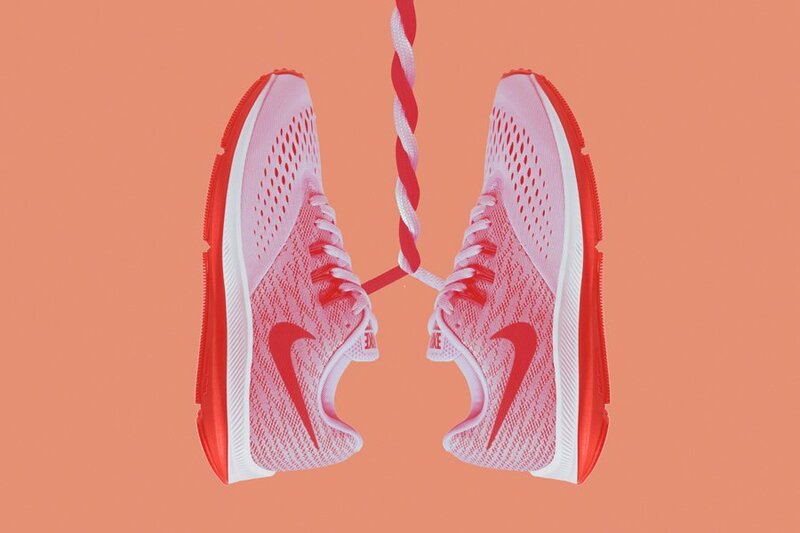 Joe Henderson, the first editor of Runner’s World, and Joan Ullyot, M.D., author of three women’s running books, first popularized the 10-percent prescription in the 1980s. “I noticed that runners who increased their training load too quickly were incurring injuries,” says Dr. Ullyot. The Exception: If you’re starting at single-digit weekly mileage after a layoff, you can add more than 10 percent per week until you’re close to your normal training load. 3. The 2-Hour Rule: Wait for about two hours after a meal before running. “For most people, two hours is enough time for food to empty from the stomach, especially if it’s high in carbohydrate,” says Colorado sports dietitian and marathoner Cindy Dallow, Ph.D. “If you don’t wait long enough, food will not be properly digested, raising the risk of abdominal cramps, bloating, and even vomiting." The Exception: You can probably run 90 minutes after a light, high-carb meal, while you may need up to three hours after a heavy meal that’s high in protein and fat. You can also grab a small snack that’s low in fat and protein but high in quick carbs 15 to 60 minutes for a run. 4. The 10-Minute Rule: Start every run with 10 minutes of walking and slow running, and do the same to cool down. The Exception: It takes less than 10 minutes to rev up on warm days. 5. The 2-Day Rule: If something hurts for two straight days while running, take two days off. Two straight days of pain may signal the beginning of an injury. 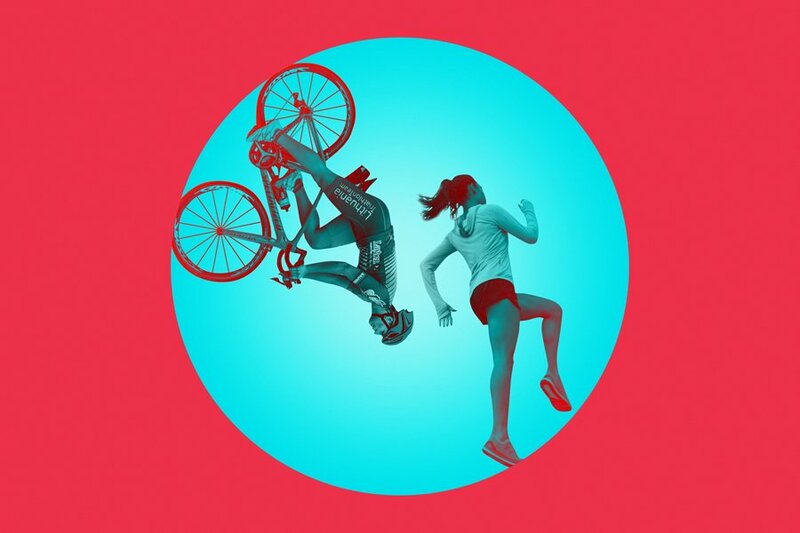 “Even taking five days of complete rest from running will have little impact on your fitness level,” says Troy Smurawa, M.D., team physician for USA Triathlon. The Exception: If something hurts for two weeks, even if you’ve taken your rest days, see a doctor. 6. The Familiar-Food Rule: Don’t eat or drink anything new before or during a race or hard workout. The Exception: If you’re about to bonk, eating something new is probably better than eating nothing at all. 7. The Race-Recovery Rule: For each mile that you race, allow one day of recovery before returning to hard training or racing. The Exception: If your race effort wasn’t all-out, taking fewer recovery days is okay. 8. The Heads-Beats-Tails Rule: A headwind always slows you down more than a tailwind speeds you up. The Exception: On point-to-point runs with the wind at your back, you’ll fly along faster than usual. 9. The Conversation Rule: You should be able to talk in complete sentences while running. One study found that runners whose heart and breathing rates were within their target aerobic zones could comfortably recite the Pledge of Allegiance. Those who couldn’t were running faster than optimal. 10. The 20-Mile Rule: Build up to and run at least one 20-miler before a marathon. The Exception: Some coaches believe experienced marathoners can get by with a longest run of 16 to 18 miles, while other coaches suggest runs up to 24 miles. 11. The Carbs Rule: For a few days before a long race, emphasize carbohydrates in your diet. “Carbo-loading” became the marathoner’s mantra after Scandinavian studies in 1967 suggested cramming down carbs following a period of carb depletion produced super-charged athletes. Experts now say simply emphasizing carbs a few days before a race over two hours works just as well. You'll want to refuel regularly on the run before your muscles become fully depleted. Try to consume 30 to 60 grams every hour, depending on your intensity and also body size. 12. The Seven-Year Rule: Runners improve for about seven years. The Exception: Low-mileage runners can stretch the seven years to well over a decade before plateauing. 13. The Left-Side-Of-The-Road Rule: To keep safe, run facing traffic. “While running, it’s better to watch the traffic than to have it come up from behind you,” says Adam Cuevas, a marathoner and chief of the Enforcement Services Division of the California Highway Patrol. It’s the law in California and many other states to run on the left side unless you’re on the sidewalk. The Exception: The right side of the road is safer when running into leftward blind curves where there’s a narrow shoulder. The right side can also be safer if there’s construction on the left side. 14. The Up-Beats-Down Rule: Running uphill slows you down more than running downhill speeds you up. The Exception: When you run point-to-point with a net elevation drop, your average pace should be faster than on a flat course. 15. The Sleep Rule: Sleep one extra minute per night for each mile per week that you train. The Exception: The extra sleep may not be necessary for some high-energy folks. 16. The Refueling Rule: Consume a combination carbohydrate-protein food or beverage within 30 to 60 minutes after any race, speed workout, or long run. “You need an infusion of carbs to replace depleted muscle glycogen, plus some protein to repair and build muscle,” says Nancy Clark, R.D., author of Food Guide for Marathoners. “Some examples would be 150 to 300 calories of low-fat chocolate milk, a recovery-sports drink, flavored yogurt, or a bagel and peanut butter.” After long or hard runs, you should increase your protein intake. The Exception: On easy days, you still need a postrun snack, but you don’t need as many calories or as much protein. The Exception: On easy days, you still need a postrun snack, but you don’t need as many calories or as much protein. 17. The Don't-Just-Run Rule: Runners who only run are prone to injury. Most of the 10,000-meter and marathon world records set in the last decade have featured almost metronome-like pacing. “If you run too fast early in the race, you almost always pay for it later,” warns Jon Sinclair, the U.S. 12K record holder and now an online coach (anaerobic.net). The Exception: This doesn’t apply on hilly courses or on windy days, when the objective is to run an even effort. 19. The New-Shoes Rule: Replace running shoes once they’ve covered 400 to 500 miles. “But even before they have that much wear,” says Warren Greene, Runner’s World brand editor, “buy a new pair and rotate them for a while. Don’t wait until your only pair is trashed.” Consider shoes trashed when the spring is gone. 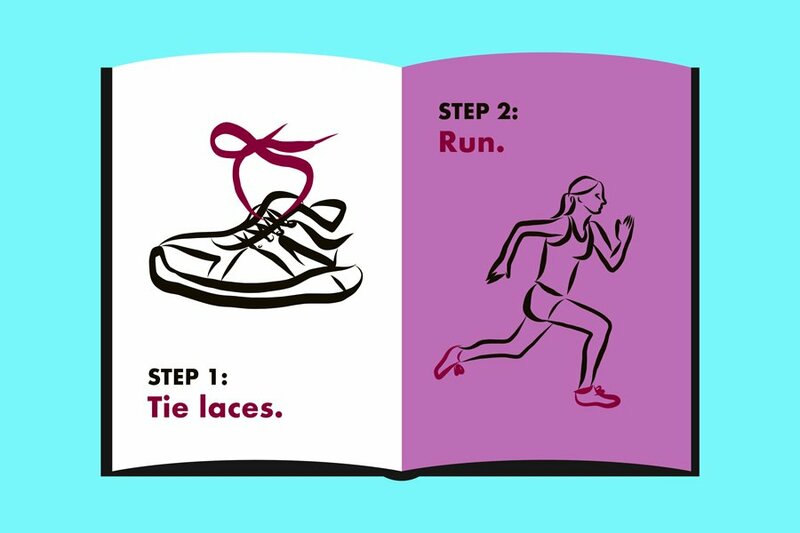 The Exception: A shoe’s wear rate can vary, depending on the type of shoe, your weight, your footstrike pattern, and the surfaces you run on. 20. The Hard/Easy Rule: Take at least one easy day after every hard day of training. “Easy” means a short, slow run, a cross-training day, or no exercise at all. “Hard” means a long run, tempo run, or speed workout. “Give your body the rest it needs to be effective for the next hard run,” says Todd Williams, a two-time U.S. Olympian and online coach at pushthepace.com. Apply the hard/easy rule to your monthly and yearly training cycles by treating yourself to one easy week each month, and one easy month each year. The Exception: After the most exhausting long runs and speed workouts, especially if you’re 40 or older, wait for two or even three days before your next tough one. 21. The 10-Degree Rule: Dress for runs as if it’s 10 degrees warmer than the thermometer actually reads. The Exception: There’s a limit to how many clothes you can take off without getting arrested, so if it’s in the 70s or warmer, wear minimal lightweight, light-colored apparel. 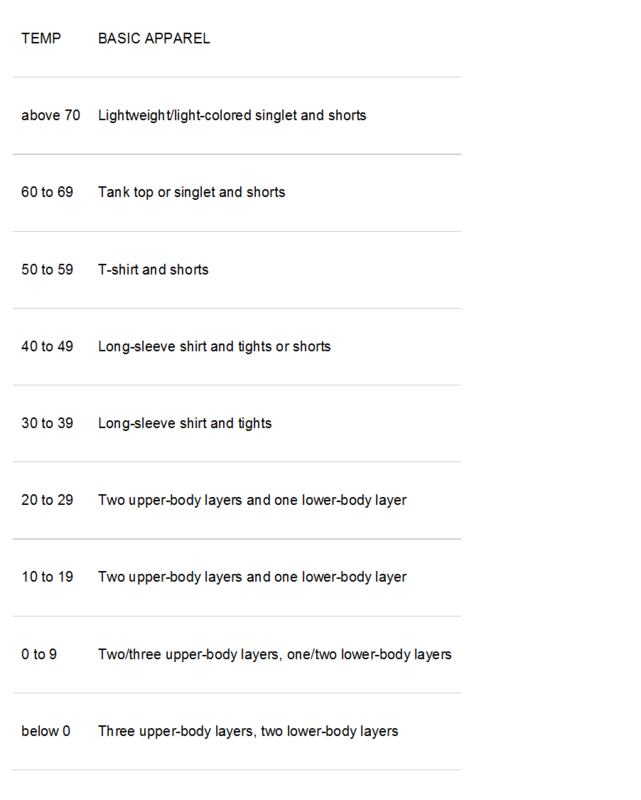 Here’s a cheat sheet to help you dress appropriately for your runs, no matter what the thermometer says. This chart factors in the 10-Degree Rule but doesn’t account for a significant windchill. On very windy days, you may need to dress warmer. 22. The Speedwork-Pace Rule: The most effective pace for VO2 max interval training is about 20 seconds faster per mile than your 5 K race pace. 23. The Tempo-Pace Rule: Lactate-threshold or tempo-run pace is about the pace you can maintain when running all-out for one hour. 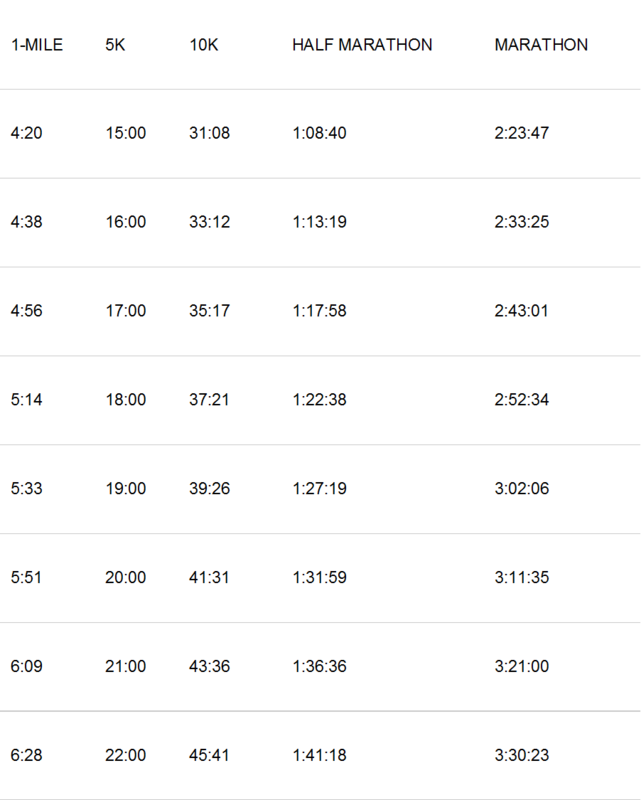 This pace is about 20 seconds slower per mile than your 10K race pace, or 30 seconds slower per mile than 5K race pace. “The key benefit of this pace is that it’s fast enough to improve your threshold for hard endurance running, yet slow enough that you don’t overload your muscles,” says Daniels. The ideal duration of a tempo run is 20 to 25 minutes. The Exception: The exact pace is less than 20 seconds slower per mile than 10K race pace for faster runners and slightly more than 30 seconds slower per mile than 10K race pace for slower runners. 24. The Long-Run-Pace Rule: Do your longest training runs at least three minutes per mile slower than your 5K race pace. The Exception: Galloway says you should run even slower on hot days. 25. The Finishing-Time Rule: The longer the race, the slower your pace. How much slower? Jack Daniels and J.R. Gilbert spent years compiling a table (below) that shows how much you should expect to slow down from one race distance to the next. “We did some curve-fitting to come up with a formula that generates a pseudo-VO2 max for each race time,” says Daniels. They sweated the math; now you just need to sweat the race. The Exception: Terrain, weather, or how you feel on race day could all throw off the table’s accuracy. Want to know how fast you should be able to run a marathon without actually running one? Look for your most recent race time in one of the columns on the left, then follow it across to your predicted marathon finish time. The chart is based on the best times from runners of various ability levels.